AS-Hex Color 1.20 - Mix colors for web pages. 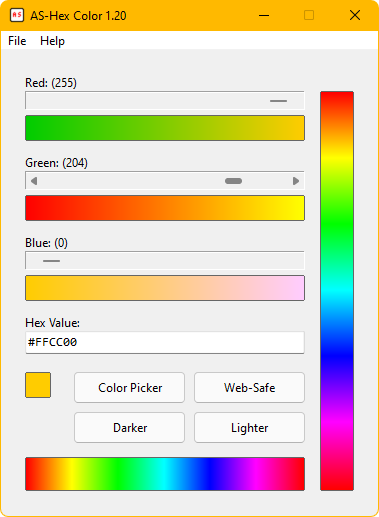 Use this program to mix base colors and get its Hex value for use in web pages. The program always shows how the color can be changed by clickable color transitions connected to each base color's control. In addition to these color transitions there is a horizontal and a vertical spectrum where you can pick colors. Double-click the color box to copy the color code to Clipboard. Press [F12] to display the current color across the whole screen. Press [F8] to switch to only web-safe color transitions. The program can calculate the nearest web-safe color. The program can also read a color code, paste/type it in the textbox and press [ENTER] to read it.